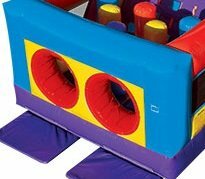 This inflatable obstacle course is ideal for school carnivals, corporate events or backyard parties. The 33 Ft. Obstacle Course inflatable play structure has a round front-loading obstacle entrance, taking participants through maneuvering pop-ups, and various obstacles. Obstacles and colors of equipment may differ slightly from the picture since we have several different versions of the fun race.